I am a postdoctoral research assistant working on satellite remote sensing of the earthquake cycle in the Alpine-Himalayan belt and am a member of the COMET (Centre for Modelling of Earthquakes and Tectonics) in Oxford. I study the earthquake cycle using optical image correlation and DEM matching to study co-seismic ground displacements and SAR interferometry to study postseismic displacement timeseries. At present I am working on co-seismic displacements during the Mw 7.7 Kaikoura Earthquake in New Zealand in order to understand the relationship between the behaviour of individual faults in earthquakes and the long term geological expression of faulting in the landscape. I am also using the postseismic displacement timeseries from the 2013 Balochistan Earthquake derived from InSAR to model the frictional properties of faults in the upper crust in the transition from velocity strengthening to velocity-weakening crust. 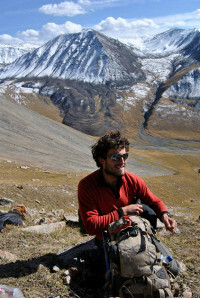 Previously, during my doctoral research, I investigated tectonic shortening in the Alpine-Himalayan belt using remote sensing and field observation, focusing on the Kazakh Tien Shan and the Turkish-Iranian plateau. The Kazakh Tien Shan and the Dzungarian Alatau, two large mountain ranges in Eastern Kazakhstan, between them take up a significant (around one quarter) fraction of the India-Eurasia convergence. I am interested in studying the spatial distribution of this convergence on modern to geological time scales. At present it is poorly known on which faults this shortening is accommodated, and geodetic data is very sparse in the region. Identifying the fastest moving and most important faults gives us an insight into the processes forming the mountains, but also holds important conclusions for earthquake hazard assesment. Tutor for the physics component of the Physics, Chemistry and Biology course. Tutor for the geophysics component of the Planet Earth course. Tutor and demonstrator for the Earthquakes and Faulting course. Tutor and demonstrator for the Remote Sensing & Active Tectonics course. Demonstrator for the Strutural Geology course. Tutor and demonstrator for the Thermal and Mechanical Models of the Lithosphere course. Demonstrator for the active tectonics component of the Greece Field Course. Leading practical class on Structure-from-Motion photogrammetry data collection and analysis. Mackenzie, D., J. R. Elliott, E. Altunel, R. T. Walker, Y. C. Kurban, J.-L. Schwenninger, and B. Parsons (2016), Seismotectonics and rupture process of the MW 7.1 2011 Van reverse-faulting earthquake, Eastern Turkey, and implications for hazard in regions of distributed shortening, Geophys. J. Int. , doi:10.1093/gji/ggw158, PDF. C. Grützner, E. Carson, R.T. Walker, E.J. Rhodes, A. Mukambayev, D. Mackenzie, J.R. Elliott, G. Campbell, K. Abdrakhmatov, Assessing the activity of faults in continental interiors: Palaeoseismic insights from SE Kazakhstan, Earth and Planetary Science Letters, Volume 459, 2017, Pages 93-104, ISSN 0012-821X, doi:10.1016/j.epsl.2016.11.025, PDF. Abdrakhmatov, K. E., R. T. Walker, G. E. Campbell, A. S. Carr, A. Elliott, C. Hillemann, J. Hollingsworth, A. Landgraf, D. Mackenzie, A. Mukambayev, et al. (2016), Multi-segment rupture in the July 11th 1889 Chilik earthquake (Mw 8.0-8.3), Kazakh Tien Shan, interpreted from remote-sensing, field survey, and palaeoseismic trenching, J. Geophys. Res. Solid Earth, 121, doi:10.1002/2015JB012763. Mackenzie, D., Y. Zhou, M. Thomas, B. Parsons (2017), InSAR Observations of Postseismic Slip following the 2013 Balochistan Earthquake, Pakistan, Session 2.03a, ESA Fringe 2017, (Oral Presentation), PDF. Mackenzie, D., K. Abdrakhmatov, G. Campbell, C. Grützner, E. Carson, and A. Moldobaeb (2015), A fault slip-rate on the northern front of the High Tien Shan, Kazakhstan, in 6th International INQUA Meeting on Paleoseismology, Active Tectonics and Archaeoseismology, pp. 271–273 (Oral Presentation), PDF. Mackenzie, D., K. Abdrakhmatov, G. Campbell, C. Grutzner, E. Carson, and A. Moldobaeb (2015b), A transect of quaternary geological slip rates in the Kazakh Tien Shan, in 6th International INQUA Meeting on Paleoseismology, Active Tectonics and Archaeoseismology, pp. 267–270 (Poster), PDF.